So time and again, I find that I am in the right place at the right time to meet the right people. It happens too frequently for me to say it’s just luck or good timing: is it my destiny to meet these people or is it my being open that allows for such meetings to occur? Whatever the reason, I am always grateful for these interactions and friendships that emerge and my time in Turkey definitely continues that trend. My first night in Cappadocia, I meet two lovely girls who help me plan my time in Turkey as shown above. They actually wrote all of this for me on my iPhone! As much as I have enjoyed my travels, there are times that it becomes quite draining with the decision making process especially when you are backpacking solo. So it’s really nice to have someone help you with the logistics for the crazy itinerary I had wanted to do and to show me how it was possible! (And it’s actually the third time this trip I have had this level of help ~ does that say more about me or about the generosity of people?). And as you can see that I already changed the plans my first day but I’m notorious for that, no? Unfortunately I can’t stay in Cappadocia for longer as there is so much I want to do and see in this vast country. So on to the next stop: Pamukkale. It means ‘cotton castle’ in Turkish and it’s easy to see why with the white washed landscape (TL). In certain ways it reminds me of home because it looks like snow but it’s actually calcium bicarbonate (TR). It’s so strange and spectacular and this place is unlike any other I’ve ever seen or been to on Earth. A big plus about taking an overnight bus is that we get here super early in the morning. Even with the slowdown in tourism, it will later become quite crowded but we were able to enjoy much of the place alone. You can walk up the sides but without your shoes to avoid damaging the environment and you are even allowed in some of the hot springs pools (MR). And there, I enjoy my most unique infinity pool experience with this incredible view (ML). 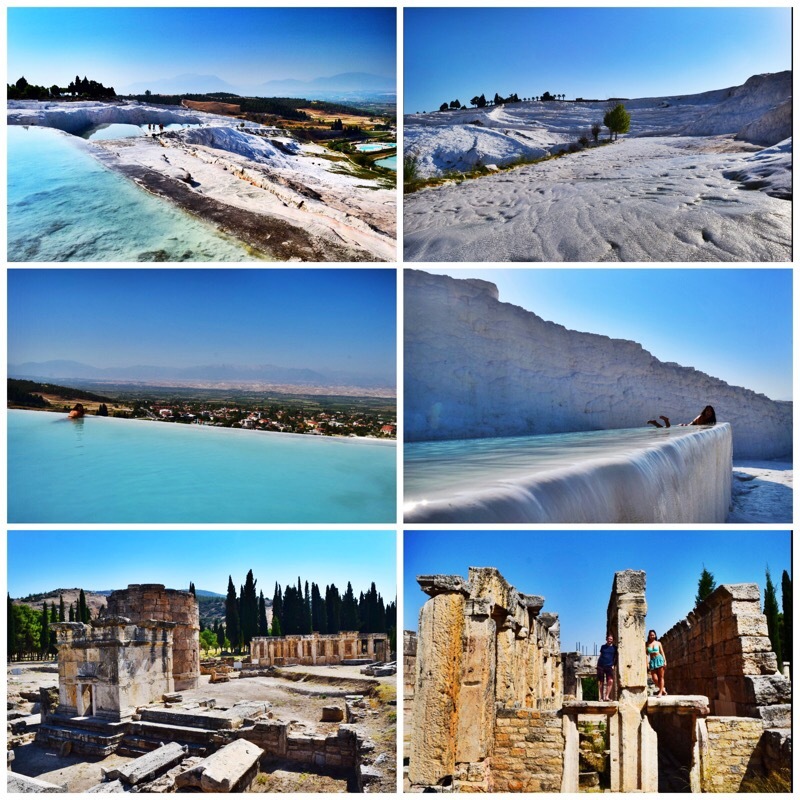 And up top, you can explore these amazing Roman ruins of Hierapolis (BL). It’s such a cool place with some great people (BR) but it’s soon time to say goodbye as I head alone to my next destination. As per the girls’ instructions, I take a lovely train ride to Selcuk. I try not to arrive into cities late at night when traveling solo but sometimes it can’t be avoided. I actually encounter a lovely older couple that insists on walking me to my hotel (which I had purposely booked due to its proximity to the train station) and end up having eating a late dinner at their house. 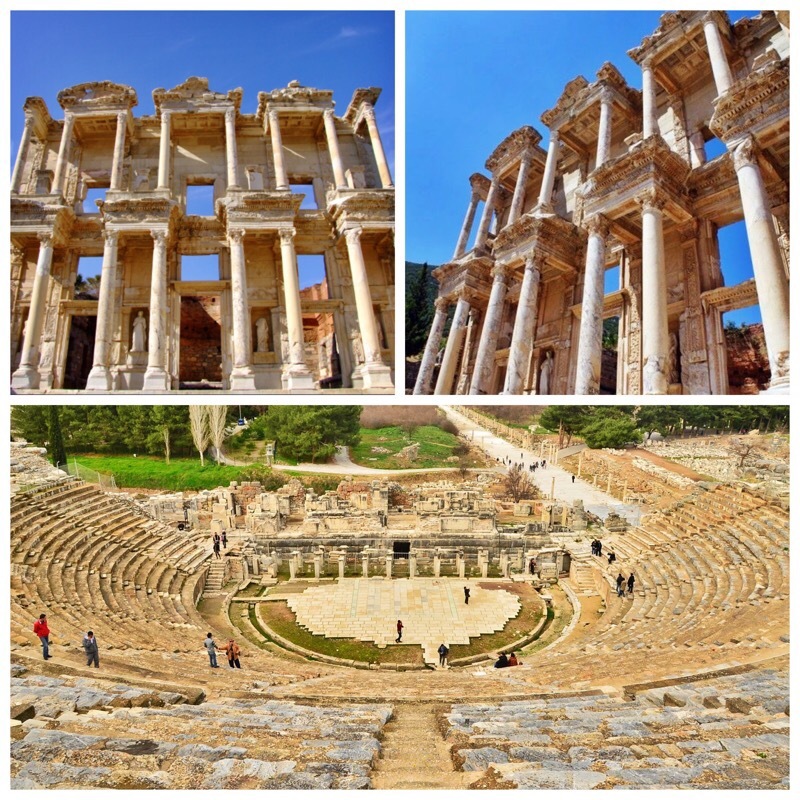 I wake up early to use the pool, have breakfast, and then head to the ruins at Ephesus (photos above). The history of the place is really quite impressive and I wonder if I’m drawn to such ancient places because I come from such a historically young country. But soon it’s time to go and it’s another afternoon train ride, this time to Izmir: Turkey’s third largest city. I explore the town center that evening (TL) and love the colorful wall murals and street art (TR). It’s a beautiful day and the locals are out enjoying themselves including some target practice (ML and MR). It’s July in Turkey so the temperatures are hot and I have been greatly anticipating the beach (BL) and it is the perfect way to spend my day. 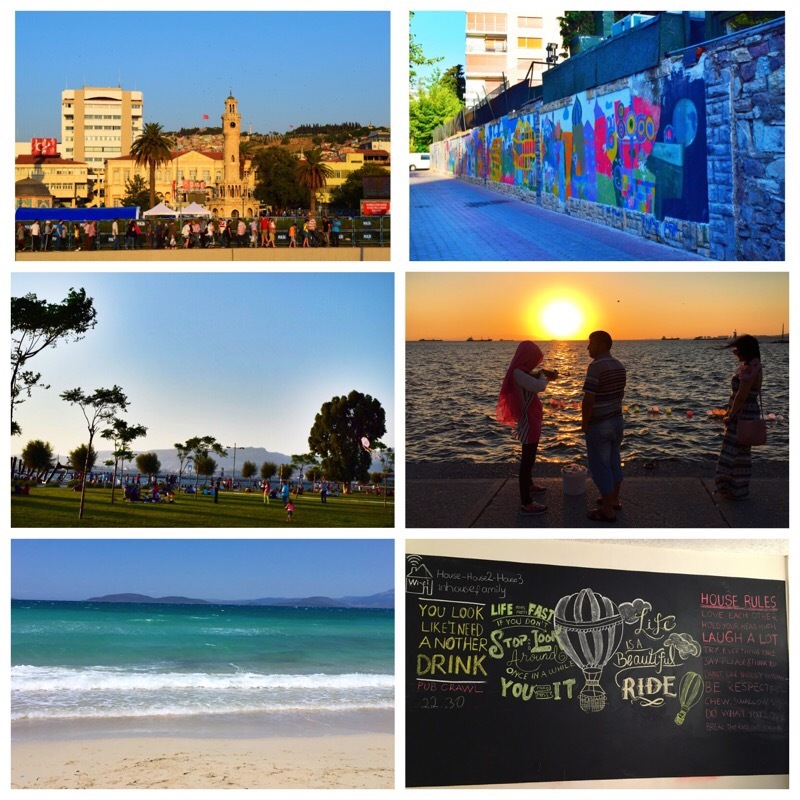 On a side note: I love staying in hostels for many reasons: the social atmosphere, the staff is typically helpful and knowledgeable about the area, and it can be a great way to help support local businesses (it pays off to do a little research to see if locals own it and they normally recommend locally owned businesses) ~ and the one in Izmir hit all three points. Not to mention they had some great sayings on their chalkboard (BR). And as I’m on my way to the airport in the morning, I am shown more Turkish hospitality when a local pays my fare. He tells me that it’s great that I would still be willing to visit Turkey after all that has happened and then leaves. I soon board my plane and am filled with such excitement. I have been dreaming about Istanbul for as long as I can remember. I’m drawn here partially for its history: Constantinople, Holy Roman Empire, Byzantium, the Ottoman Empire, now the modern state founded by Ataturk all having occupied the area. I’m also fascinated by the geography ~ the East and the West come together for me more vividly here than anywhere else in the world with Turkey’s Asian and European sides and the especially picturesque Bosporus Strait. 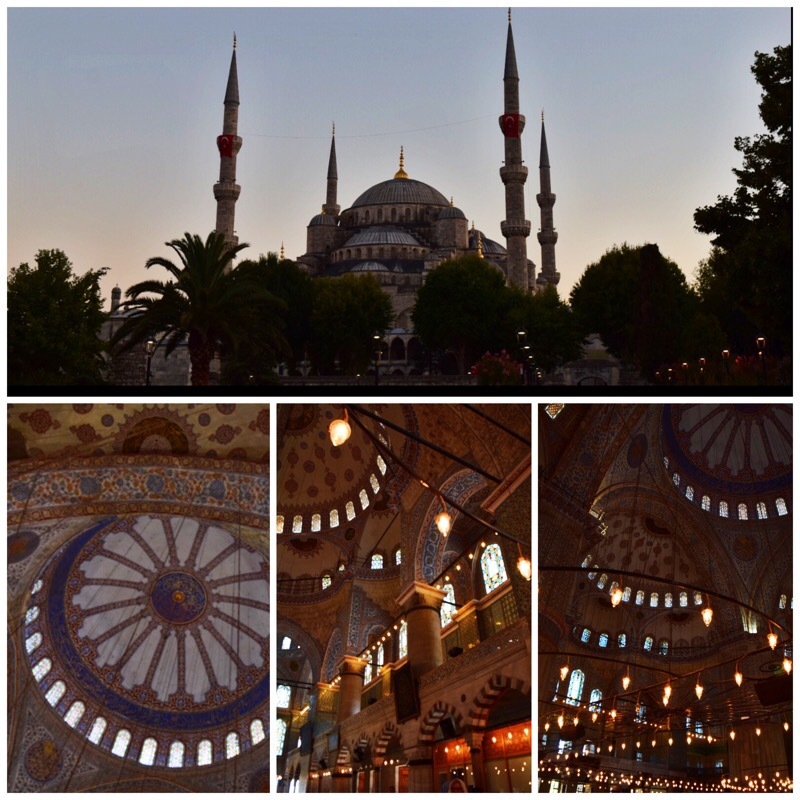 I stay in the Sultanahmet/Old City part of European Istanbul and immediately am enamored. 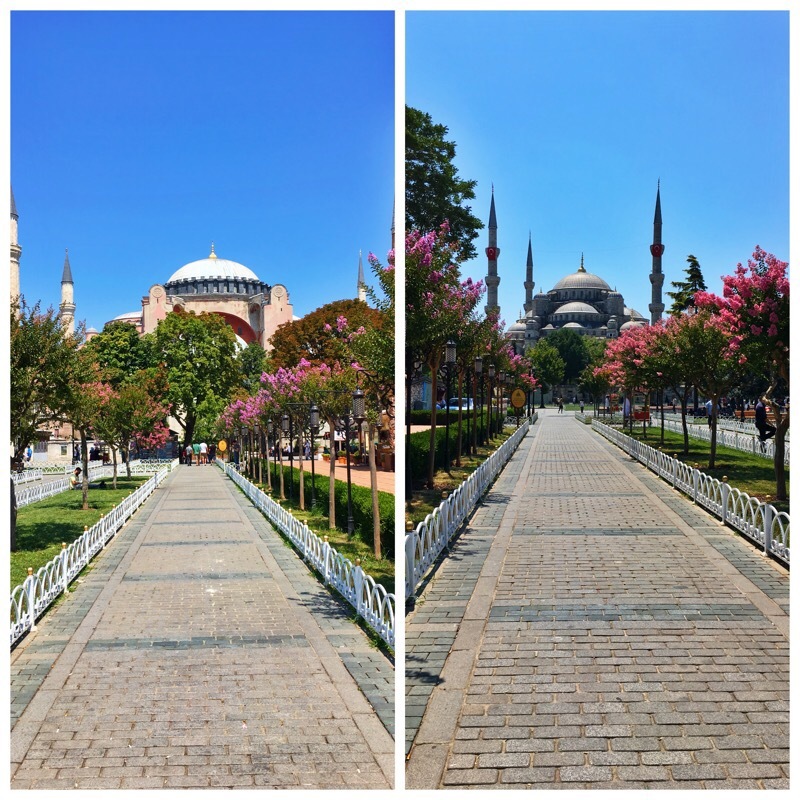 I try not to be too conspicuous when I travel but here I find myself still with my bags and taking pictures because I can hardly believe that I’m in Istanbul and literally from this spot ~ on one side I see the Hagia Sophia (L) and on the other, the Blue Mosque (R)! 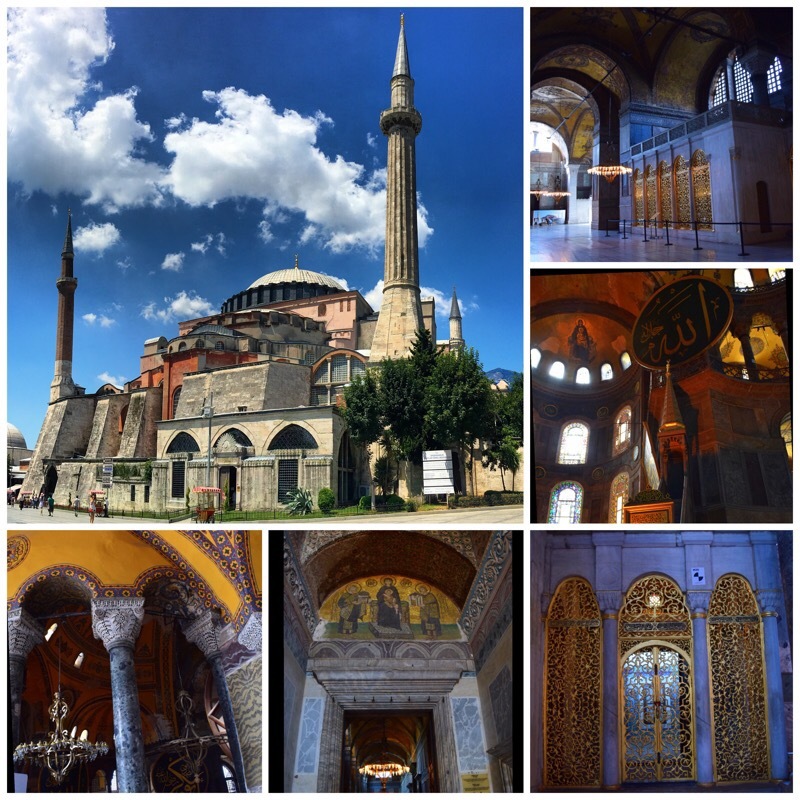 I buy a Museum Pass Istanbul (MP) for 85 TL (about $28 USD at the current exchange rate) that is valid for 5 days and head to Hagia Sophia (TL). 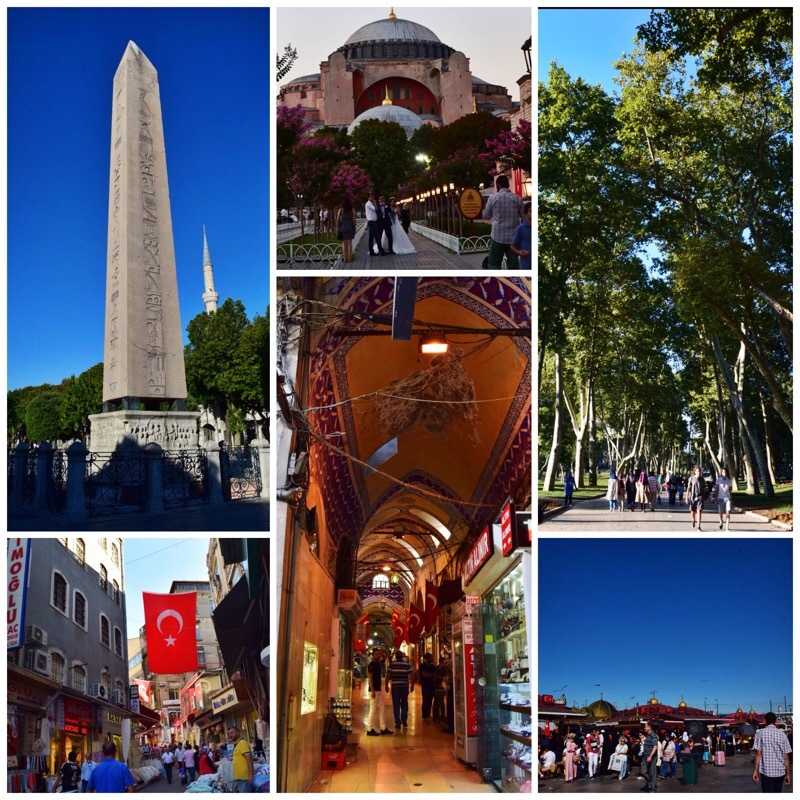 I am told that tourism is expected to be at 4 million (down from 40 million the previous year) and that was before the ‘coup’ and my initial days in Istanbul reflect that experience. On one hand it is nice to have the entire building almost to myself and be able to take these photos without anyone in them but I also know how much the economy depended on tourism and how the Turkish people will have to bear that pain and ultimately wish that people wouldn’t have stayed away. But I am here and am in awe of this former church then mosque and now museum. You can see that history vividly (MR) and also see some beautiful mosaics (BL and BM). 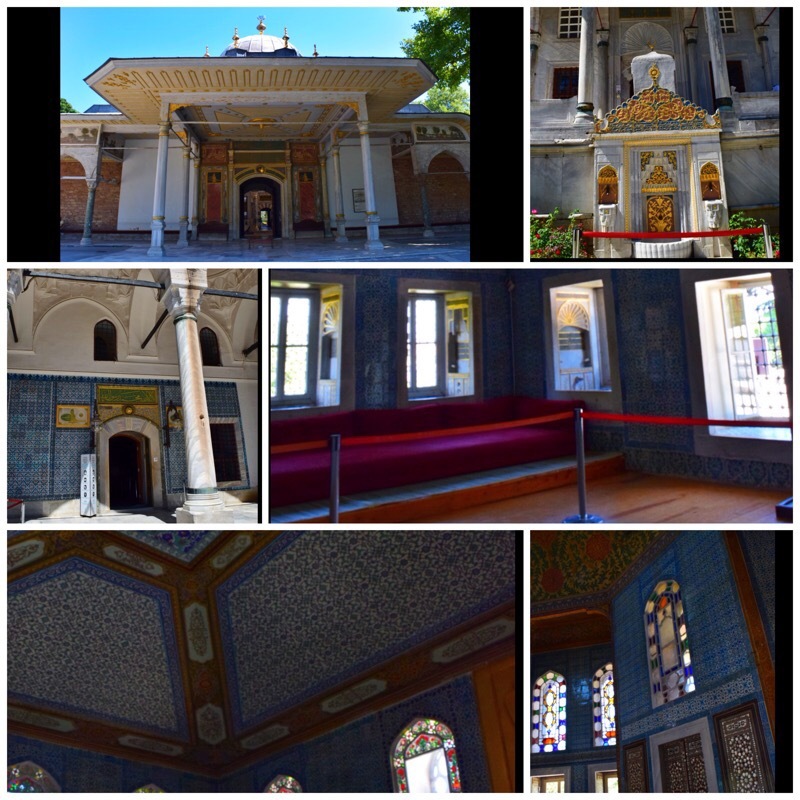 Also part of the MP is the Topkapi Palace. It served as the home for Ottoman emperors for centuries and the four courts are quite impressive. 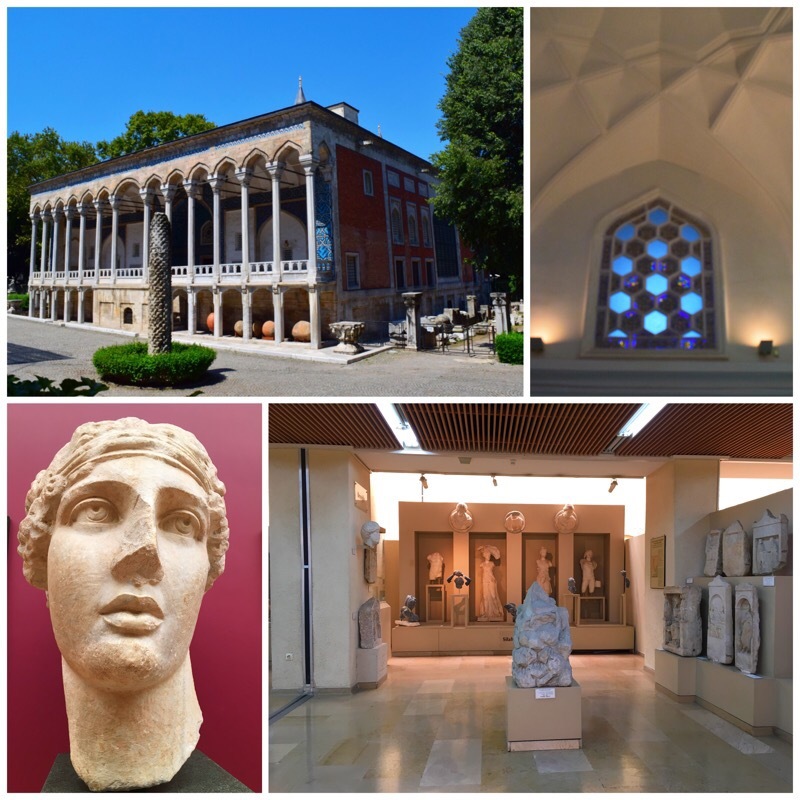 You can see a really cool weaponry display, Islamic and Christian relics, rugs, porcelain and even the Prophet Mohammad’s possessions among many other items in these beautifully intricate buildings. You aren’t allowed to photograph in a lot of places so you’ll just have to go and see yourself. I can only show you a bit of the grandeur with these building and interior pictures. You can also visit the Archaeology museums with your MP and it’s really quite stunning even under renovation. This may be my favorite building (TL) here but was so difficult to photograph (TR) as the magic was in how light streams through the windows. And then with the artifacts found in the other buildings, I am in total nerd heaven! You don’t have to pay an entrance fee to get into the Sultanahmet aka Blue Mosque but you are required to dress appropriately. The nice part is that they will lend you garments if needed. I love places of worship in general but this visit is special in that this is my first ever foray inside a mosque. I will go on to see many other mosques but this will be always hold a special place in my heart. Some of the other things I see in Istanbul. TL: The top remaining part of the Obelisk of Theodosius in the Hippodrome of Constantinople (it’s 3500 years old!) TM: A married couple being photographed in front of the Hagia Sophia. TR: Gülhane Park ~ I love green spaces and places where locals go to relax BL: Turkish flags were everywhere BM: The Grand Bazaar and those are all vendors ~ yes it is so empty that I take my bag, camera and phone and am comfortable taking pictures. BR: The hustle and bustle of Eminonu Pier near Galatea Bridge and where you go to get fresh fish sandwiches. And one of my favorite things I do my entire trip is my sunset/evening cruise on the Bosporus. 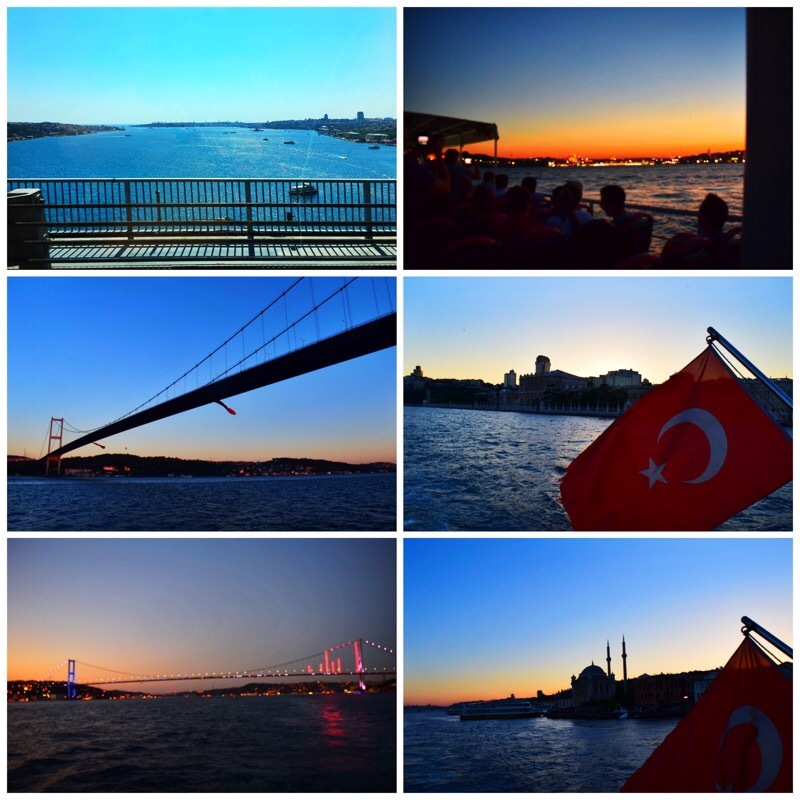 TL: Overlooking the Bosporus from the Galata bridge and the other images are from the cruise. I feel at home here; I have been told that this city is quite enchanting and I’m finding that to be true. It is supposed to be my last night in Istanbul and Turkey but fate throws a curveball for me ~ however that is an entirely different story that I won’t get into here. And so there it is for me: destiny is like Turkey in that it’s not easily categorized. You think you understand how it works in the same way that you think you know what a place will be like but both surprise you sometimes in startling ways. Yes sometimes it seems like the universe conspires on your behalf but it is still up to you to see it and respond accordingly. And what about those instances that seem to make no sense or have no good reasons behind them? Fate reminds me of Turkey as an eternal crossing point because it is your choice for what to do when you get there. You can’t always control what happens but you can always choose how you respond. People, places, themes come and go ~ sometimes repeatedly and what do you take from them ~ what lessons do you learn and how do you use them to grow? It’s a constant but worthwhile effort so remember: be brave, be strong, be confident to live and love the life you are meant to ~ with no regrets ❤️.